Cataloochee Valley in the Smokies is of course most popular during the green seasons. People come from far and wide to experience the wildflowers in Spring, the myriad of hiking trails in Summer, and the exciting elk rut and colorful foliage in Fall. But Winter too has its appeal. Perhaps the best reason to go to Cataloochee in winter is the solitude. The crowds are considerably smaller. The wildlife is still there. The trails are just as inviting. The views are every bit as scenic. The creeks are refreshing as always. Sure, it isn’t green with all the leaves down. Yes, the air is colder, but if you dress right, you can be just as comfortable. What’s not to like? I went on a four mile hike on Rough Fork Trail on New Year’s Eve and didn’t see another soul until I was almost finished. I counted more elk and turkeys in the woods than people. It was quiet, except for the cascading streams and the occasional bugle call of a big bull elk signaling to his harem that it was time to move on. 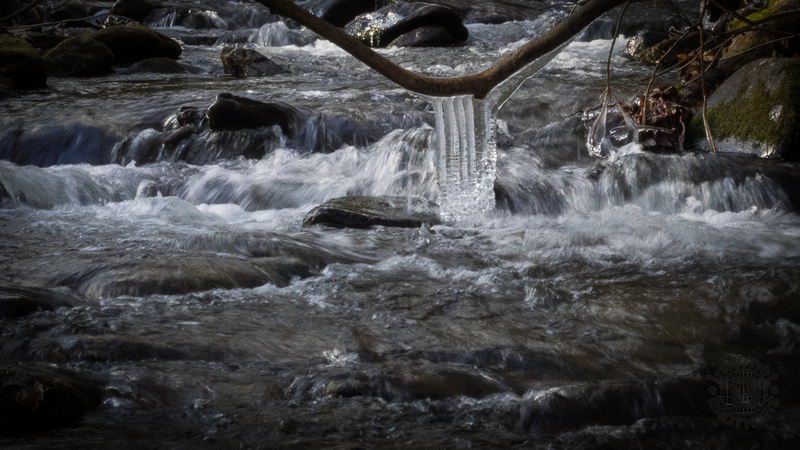 Come along with me on this photo tour of what you can expect at Cataloochee in winter. 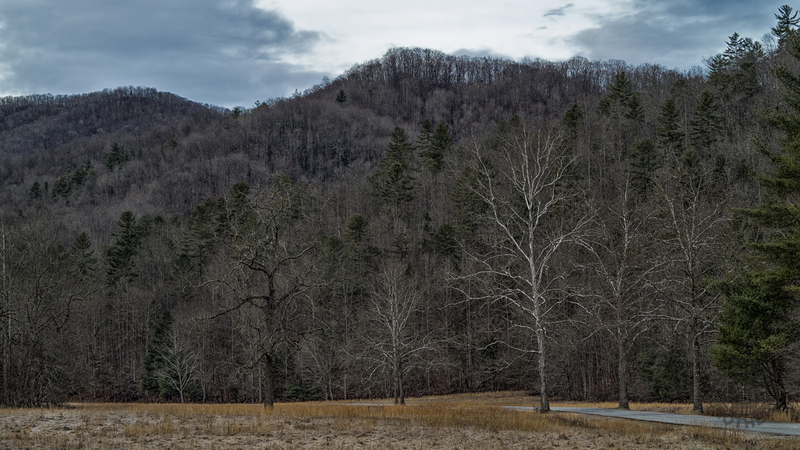 As the road into Cataloochee Valley passes the Ranger Station, you enter a series of long, narrow open meadows that are surrounded by glorious mountains. The Cherokee called it “Gadalutsi,” referring to the tall rows of trees along the ridges surrounding the valley. Just past dawn and just before dusk, these meadows are usually teeming with wildlife feeding on the plentiful tall grass that is reminiscent of wheat fields. Aside from the natural splendor to be found at Cataloochee, there is quite a bit of human history in evidence as well. 19th Century churches, schoolhouses and settler’s homes can be found in the open areas. Couple that with more homes, stone walls and cemeteries hidden deep within the forest, and there is plenty of yesteryear to explore. 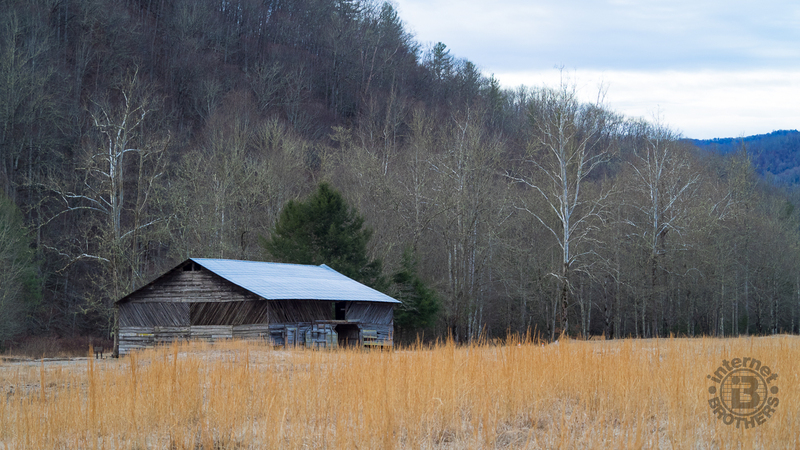 This is Caldwell Barn, located just across Cataloochee Creek from Caldwell House. Here’s a safety lesson for you. 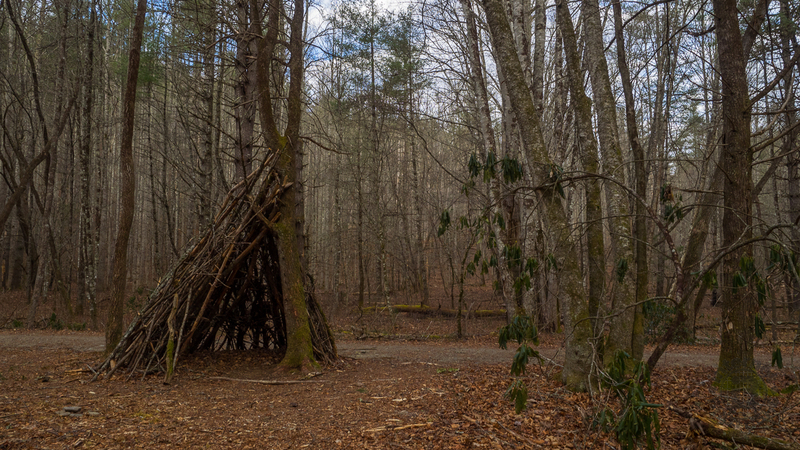 If you are ever trapped, injured or lost in the woods and dark is fast approaching, you can build yourself an emergency shelter by propping sticks against a tree in lean-to fashion. Obviously it won’t protect against a hard rain, but it may keep you from getting snowed on, and coupled with a campfire will keep you warm from the elements. 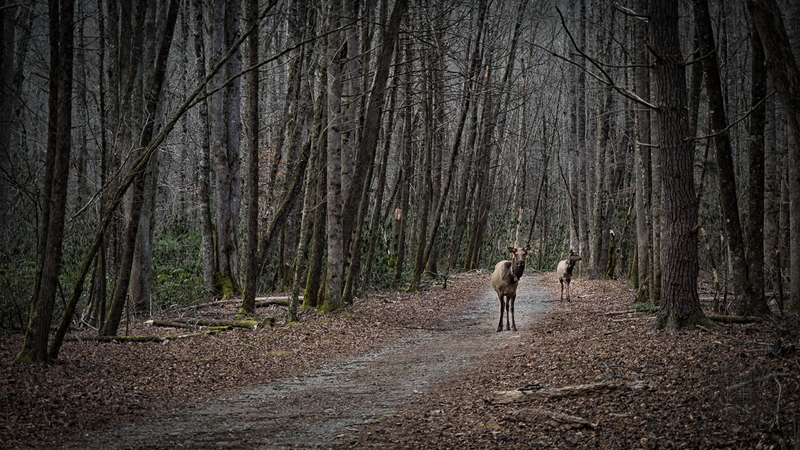 As I was hiking along Rough Fork Trail, suddenly ahead of me was a cow elk and yearling coming toward me. I surveyed my surroundings and moved behind a tree about 20 yards off the trail. Always give wildlife the right of way. After all, this is their home. We are just visiting. After the mama elk realized I was not a threat, they meandered on by. Elk cows aren’t likely to attack unless provoked, but be very wary of a bull. They are massive animals and will protect their territory. No, you aren’t going to find wildflowers in winter. Nor will you see emerald green grass or leaves. But there is still plenty to find in the forest, even on the coldest days. 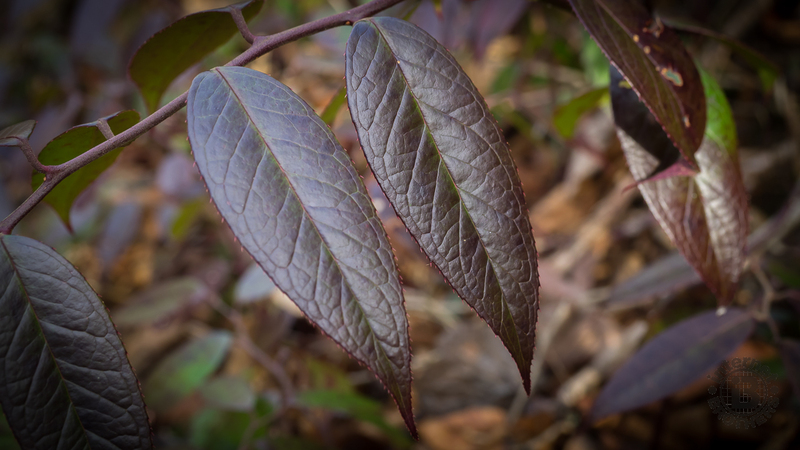 As you scroll through the photo gallery below, look at some of the plants I found along my route. When hiking in winter, take your time as you stroll through the forest and look for the unseen.